Greetings, Stampers! To all the moms out there, Happy Mother's Day! 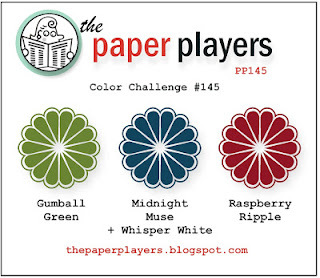 It's time once again to have some fun with The Paper Players. This week Jaydee has a color challenge for us: Gumball Green, Midnight Muse and Raspberry Ripple. Initially, I was a little stumped by this color combo, but then I remembered that my Print Poetry DSP stack has all three colors. 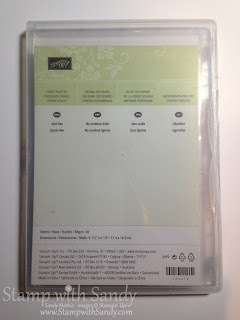 However, it wasn't until after I had my card assembled that I noticed that I was supposed to use Whisper White. Instead, I used Very Vanilla because it was a color in the stack. Oops! I hope Jaydee and the rest of the Design Team don't mind! When I saw that the Fusion Card Challenge this week included a photo with teacups, I couldn't resist playing along with them, too. 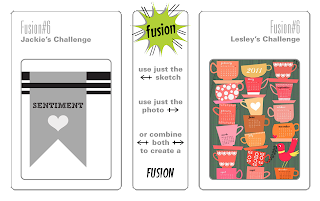 I didn't use the sketch, but that's the fun part about that challenge, you can use either or both! I love all the patterns in Print Poetry. This is such a fun stack of paper that includes all the 2012-2014 In Colors. 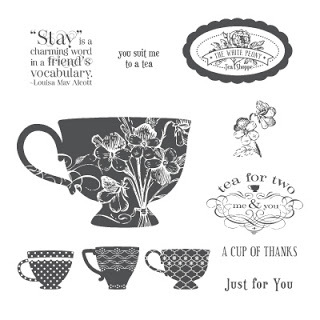 The teacups and sentiment are from the Tea Shoppe Stamp Set. Both of these products will be retiring at the end of this month. 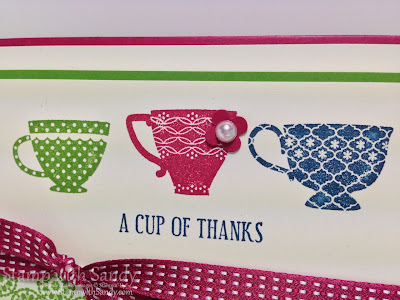 I could have colored the three teacups on the stamp with markers, but when I first purchased this stamp set I used my craft and rubber scissors to separate them, so I could stamp them individually. My Stamp-A-Ma-Jig helped me line things up perfectly. One last thing, a little storage tip... Did you know that Stampin' Up's DSP stacks, which measure 4 1/2" x 6 1/2", fit just perfectly inside their Clear Mount Stamp Cases? I discovered that while traveling, because I was stuffing anything I could (including Pearls, Rhinestones and Bakers Twine) into these handy little cases. Keep a package of cases on hand next time you need to bring some stamping supplies on vacation, like me, or just for organizing your craft space! What wonderful tea cups! Thanks for joining us at Fusion! Super sweet card..love these colors together. Thanks for joining us at Fusion. Love this, Sandy! 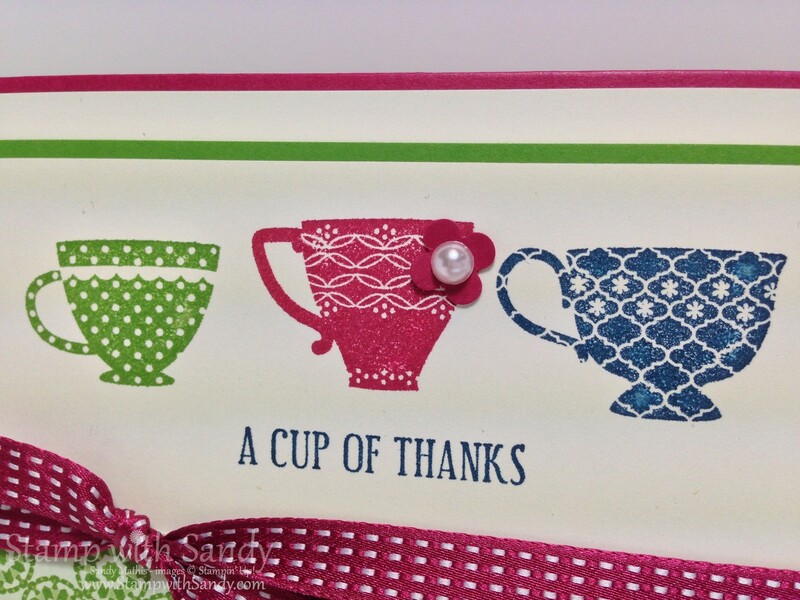 Those tea cups are so sweet and this is a clever way to use the dsp. And I LOVE the tip about how to store these little paper stacks -- I am so going to do this! I wondered when I saw your card in the gallery, if you had played with the Fusion challenge! So cute! I haven't had a chance to play with that one yet, but this week's is so cute, I am going to try. Your sketch and use of the teacups is perfect! And thanks for the tip about the cases....I am finding lots of good uses for them too! 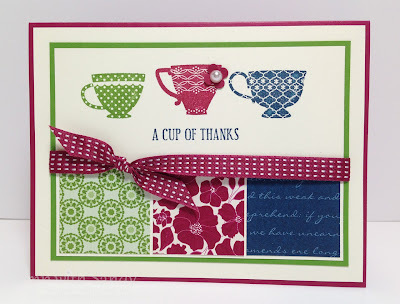 Gorgeous stamping Sandy - LOVE those tea cups! Cute cups and a terrific colour combo - very striking. This is a fabulous card, Sandy! I love your use of the cups with these colors--just like a set of fine china! The dsp is perfect too and I love the addition of the little flower. FAB storage tips too!